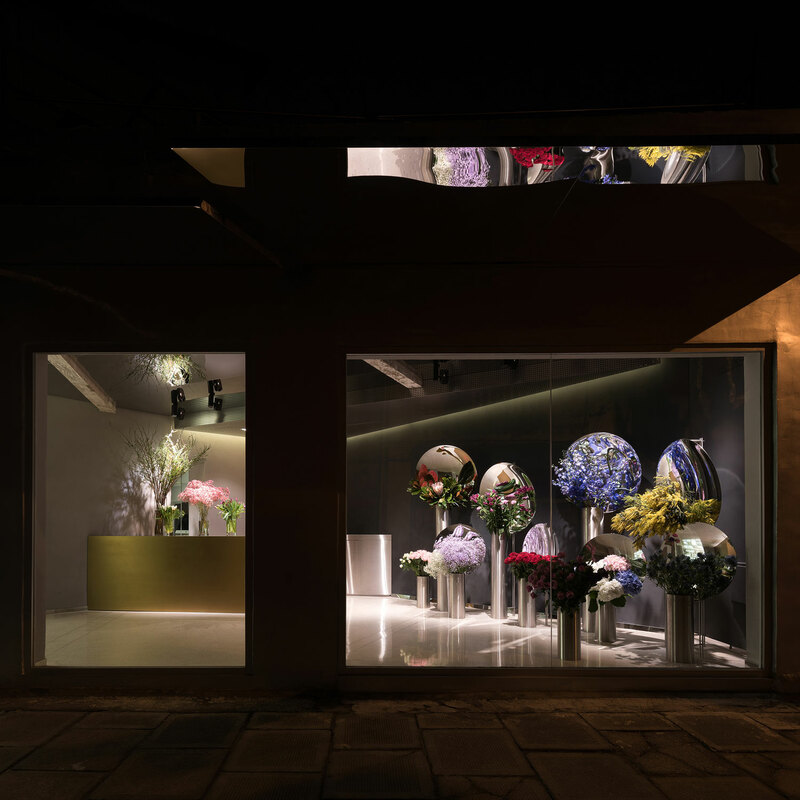 Flower Shop in Shanghai by Alberto Caiola. 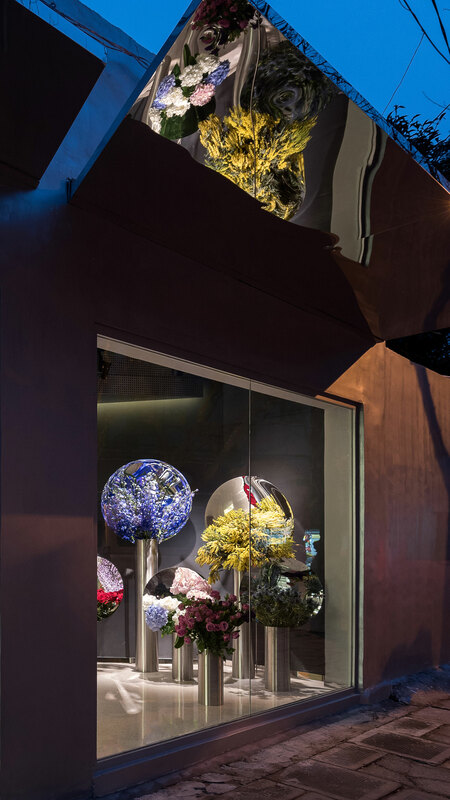 Part of an emerging new wave of contemporary florists, July’s Flower by Alberto Caiola juxtaposes Shanghai’s innate and edgy counterculture with the time-honoured traditions of horticulture and floral design. Smashing straight-laced stereotypes through striking arrangements and design, July’s challenges expectations at all levels. 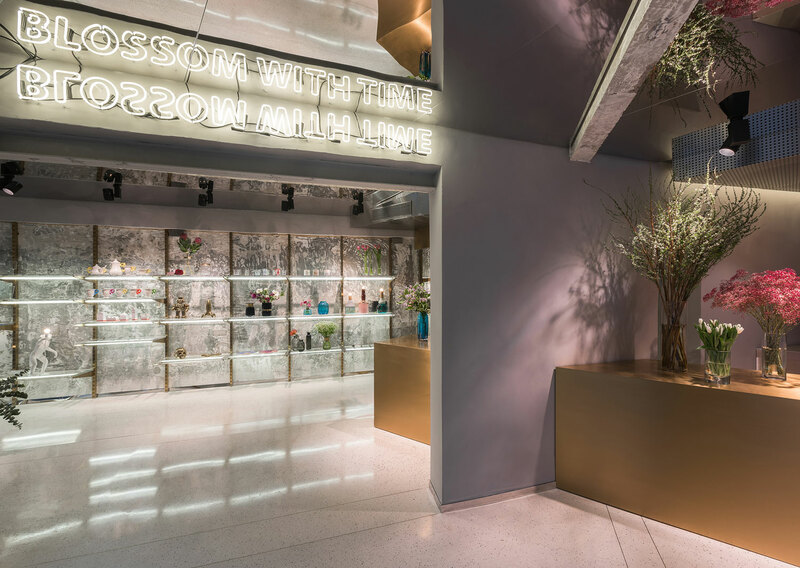 The store’s interior incorporates a spectrum of materials, balancing brushed metal finishes with the natural textures of terrazzo flooring. Large expanses of horizontal and angled mirrors positioned on the store’s celling create the illusion of a much larger space. Amplifying the volume’s height, the effect appears to defy the laws of gravity. In stark contrast, exposed concrete beams reveal the building’s original structure. 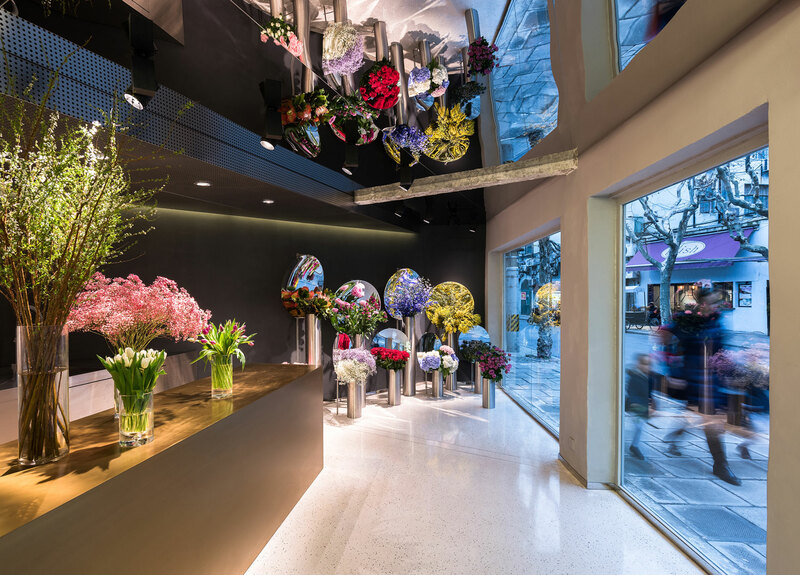 Flowers are the store’s natural centrepiece. Displayed in clustered pots adjacent to large mirrored dishes, the result is a cornucopia of images, the blossoms reflected ad infinitum to intriguing effect. Navigating the space, visitors experience both a mingling and a movement of colour and shape. 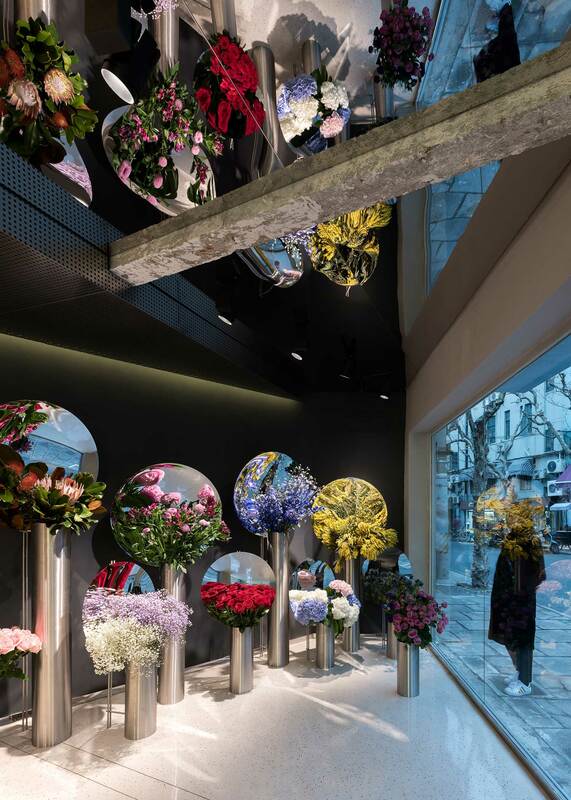 A designated showroom area presents a selection of flower-related products, as well as a curated selection of design pieces. Built on brilliance and transparency, the display quite literally glitters against the store’s raw concrete background. It is not just the interior of July’s Flowers that seeks to disrupt the relationship between conventional and contemporary, but also its facade. In stark contrast with its traditional residential neighbours, a polished metallic finish draws attention, shifting according to the angle at which it’s viewed. 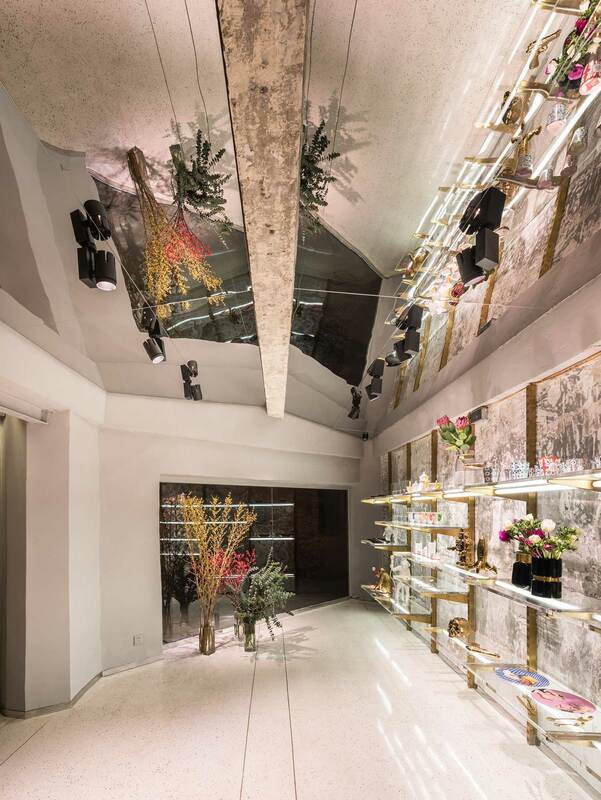 At the same time, indoor mirrors seemingly push themselves out of the building, bouncing both natural and artificial light, all serving to create an enticing and inviting storefront. Breaking barriers of tradition, expectations, and perception, July’s Flowers defines Shanghai in bloom. Related Post: Botanist Cocktail Bar in Shanghai by Alberto Caiola. 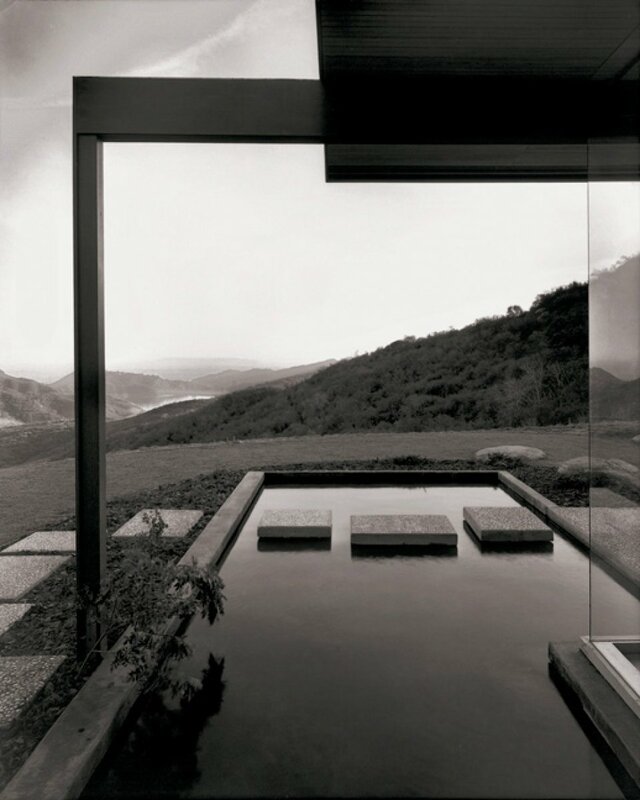 Baffle House by Clare Cousins Architects. 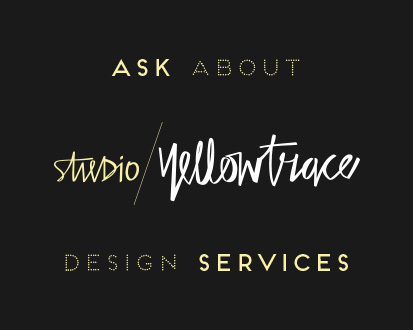 Stories On Design // Lusty Libraries.